“On August 6, 1945, a single atomic bomb was unleashed on Hiroshima. This absolute evil instantly seared the entire city, slaughtered children, the elderly, and many other innocent people. By the end of the year, 140,000 precious lives were taken. An additional 70,000 lives were taken by the bomb dropped on Nagasaki three days later. “Those who managed to survive suffered the after-effects of radiation, encountered discrimination and prejudice, and still carry deep scars in their minds and bodies. Nine nations possess nuclear weapons and at least five others – all NATO states – have nuclear weapons deployed on their territory: Germany, Belgium, Italy, the Netherlands and Turkey. Roughly 1,800 are on high alert status at any given time and can be launched with minutes. Many are deployed in submarines and aircraft close to potential target countries, increasing the risk of a pre-emptive first strike, an option that both the United States and Russia refuse to rule out. Horrible as the first atomic bombs were, they pale in comparison to the destructive power of modern thermo-nuclear weapons. A one kiloton detonation would be the equivalent of 1,000 tons of TNT. The bomb dropped on Hiroshima was 15 kilotons. Russia, as early as the 1960s developed and tested a nuclear weapon aptly named the “Tsar Bomba”, with a destructive force of 50,000 kilotons, 3,300 times more powerful than that dropped on Hiroshima. Scientists have determined that an exchange involving just one percent of the current global arsenal of nuclear weapons — given the immediate blasts, radiation and the nuclear winter that would follow as a result of the dust and debris blown into the atmosphere — could literally end life on earth as we know it, if not entirely. Notwithstanding great strides in previous decades between the US and former USSR that reduced the number of nuclear weapons from a cold-war high of 70,000, and despite a legal commitment contained in the Nuclear Non-Proliferation Treaty of 1970 to pursue total nuclear disarmament, movement today among nuclear armed states and their allies is in the wrong direction. The United States has announced that it will spend up to US$1 trillion to modernize its nuclear arsenal over the next 30 years and President Trump has recently spoken of expanding US nuclear capability even further. Russia and China, following the U.S. lead, are expanding their nuclear capability, both on land and at sea. France is adding new missiles to its submarines. The U.K. is replacing its Trident nuclear armed submarines. Israel is adapting its cruise missiles to be launched from submarines. India and North Korea, are developing new long-range missiles. And Pakistan is threatening to develop tactical nuclear weapons to deploy to Kashmir. There is also talk of launch authority being delegated to field commanders. Last year the NATO Secretary General warned that more than 30 nations have or are building ballistic missiles capable of carrying nuclear warheads, and there is enough weapons grade fissile material in the world to produce up to 200,000 nuclear weapons. Add to this deadly mix the very real prospect of nuclear terrorism. Both Al Qaeda and Daesh (ISIS) have declared their intention to acquire nuclear weapons capability. Unless something changes, it is simply a matter of time before they or another such group does so, and a virtual certainty that if they do, they will use them. Experts have also warned that terrorists may soon be able to launch a cyber-attack, creating the illusion that a nuclear attack is underway in order to elicit a real world, in-kind response. It has been reported in US media that from 2010 to 2014, the US Nuclear Security Administration was successfully hacked 19 times. Given our current path, it is only a matter of time until there is another nuclear event. Our only hope is to free the world of nuclear weapons completely and to establish effective means to monitor the behavior of states and non-state actors in order to ensure compliance. Five Nuclear Weapons Free Zones have been established. Latin America and the Caribbean, The South Pacific, South East Asia, Central Asia, and Africa, prohibit nuclear weapons in 115 nations, involving almost 40% of the world’s population. But until recently the international community had not achieved a global ban on nuclear weapons. A major hurdle had been the fact that for decades, negotiations were restricted to the Conference on Disarmament, a closed club of 65 States that operates on a consensus basis, requiring unanimous agreement before anything is approved. The CD has been unable to agree even on a program of work for more than 20 years and is, for all intents, a dead forum. Frustrated by lack of progress and lack of good faith by nuclear-armed states, in 2013 and 2014 roughly two-thirds of the world’s nations participated in three open international conferences held in Norway, Mexico, and Austria that studied the nature of the humanitarian threat posed by nuclear weapons. 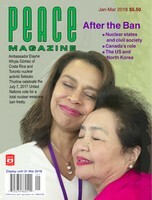 In August 2016, the Working Group adopted a report recommending that nuclear disarmament negotiations commence in 2017, and a year ago — 71 years after the bombing of Hiroshima and Nagasaki — a full two-thirds majority of the world’s states mandated the negotiation of a new international treaty that would legally prohibit nuclear weapons, leading toward their total elimination. Negotiations conducted in New York in March, June, and July 2017, concluded on July 7th with 122 of 124 participating states endorsing the historic and far reaching text of the Treaty on the Prohibition of Nuclear Weapons. (The Netherlands, the only NATO state to participate, voted against adoption of the text and Singapore abstained). Inter alia, the Treaty prohibits, under any circumstances, the development, production, testing, manufacture, acquisition or stockpiling, transfer, use or threat of use of nuclear weapons or other nuclear devices. It further prohibits assisting, encouraging or inducing the activities mentioned, including disallowing the stationing, installation or deployment of nuclear weapons on territory of or under the control of a state party to the Treaty. Article 4 sets out general procedures for negotiations with nuclear armed states wishing to become party to the Treaty, including a requirement for the immediate removal from operational status of any nuclear weapons and their irreversible time-bound elimination, within a deadline and verified by a competent international authority to be decided upon at the first Meeting of States Parties, which will take place within a year after the treaty enters into force. (The Treaty will enter into force 90 days after 50 states have ratified). The Treaty also requires states that have not yet done so to enter into safeguards agreements with the International Atomic Energy Agency (IAEA). Article 16 stipulates that the Articles of the Treaty shall not be subject to reservations; i.e. States Parties must accept the obligations as set out, in their entirety. In sum, the Treaty on the Prohibition of Nuclear Weapons imposes comprehensive measures for the verified, time-bound, and irreversible elimination of nuclear weapons. It opened for signature on 20 September in New York during the High Level segment of the UN General Assembly. On that day alone, 50 States signed the Treaty and three States ratified it. It should enter into force sometime in the next year or two. Of note, the International Campaign to Abolish Nuclear Weapons (ICAN) comprised of hundreds of civil society organizations from around the world has won this year’s Nobel Peace Prize for the vital role it played in advancing the nuclear disarmament cause and facilitating negotiation of the Treaty. Still, nuclear armed states and their enablers refuse to be moved. They continue to spout fealty to the longer term goal of nuclear disarmament, while expanding their arsenals and brandishing nuclear weapons as the ‘supreme guarantor’ of national and international security. Canada, for its sad part, submitted without protest to the US demand that NATO states boycott negotiation of the Treaty. Our Prime Minister – son of a powerful advocate for nuclear abolition – has dismissed the endeavor as “useless” and senior members of his Cabinet have characterized Treaty proponents as naïve idealists. What happened to that sentiment and that determination? No doubt it has been tempered by ongoing trade considerations with the United States, as well as increased pressure from the US in particular to maintain NATO solidarity. All the more reason why Canadians must continue to press our Government champion the cause of nuclear disarmament. d) help to develop effective measures to ensure common security for the global community. The Canadian Pugwash Group has called upon our government to host a high-level government-civil society roundtable to explore the development of a comprehensive, whole-of-government approach to sustainable peace and common security. Ceasefire, the public outreach arm of the Rideau Institute, has posted a petition on its website Ceasfire.ca and invites Canadians to sign a Declaration of Public Conscience in support of the Treaty and the total elimination of nuclear weapons. The Canadian Network to Abolish Nuclear Weapons (CNANW) and Canadians for a Nuclear Weapons Convention (CNWC) representing more than 1,000 recipients of the Order of Canada continue their respective robust campaigns to have Canada play a leadership role on the nuclear disarmament issue. Clearly, breaking the nuclear disarmament logjam globally will require concerted, international action on an unprecedented scale. Given that 122 states have already endorsed the text of the new Treaty and will likely ratify it over the next few years, the new legal prohibition on nuclear weapons will soon been firmly established in international law. Although the legal provisions will apply only to States Party to the Treaty, the instrument constitutes a significant paradigm shift with respect to global norms and attitudes toward nuclear weapons. How might this play out in real terms? States Parties to the Treaty could offer significant inducements to States that give up nuclear weapons, including security guarantees. On the punitive side, though not addressed explicitly in the Treaty, States Party could impose restrictions on transit of nuclear weapons over or through their territory, and on investment in enterprises that directly or indirectly contribute to the development, production, deployment or use of nuclear weapons. Given the magnitude and nature of the threat posed by nuclear weapons, in my view, the international community would be justified in regarding all nuclear armed states as “rogue states,” and in employing the widest possible range of diplomatic, political, economic, social and cultural tactics and strategies to press them to give these weapons up. Just as a combination of national and international pressure brought an end to slavery, colonialism and apartheid, it can help bring about a nuclear weapons free world. We need to enlist the support of the heads of all major religions; current and past heads of state and government who have not yet declared support; royals and their equivalents; humanitarians, philanthropists, business people, popular celebrities who can influence attitudes via popular culture; and many millions more concerned individuals throughout the world. Collectively, we can prevail over the truly “naïve”—those who believe that they can curtail the nuclear ambitions of others while retaining and expanding their own nuclear arsenals, who cling to the tragically misguided belief that that nuclear deterrence would or could be effective in the long term, or at all should terrorists ever acquire nuclear capability; and who think that accidental detonation can be avoided indefinitely. The longer nuclear weapons exist, the greater the risk. We need to induce, impel and if necessary to compel those who continue to hold the world hostage to their nuclear ambitions to STOP NOW, before it is too late! Earl Turcotte, a former Canadian and United Nations disarmament diplomat, is a member of the Canadian Network to Abolish Nuclear Weapons, the Canadian Pugwash Group and the Group of 78.